SAN FRANCISCO—At 5:30 on a Saturday morning, the plaza behind San Francisco’s iconic Ferry Building is empty—the world, dark, and the air, silent, save for the sound of the water on the nearby pier. Then, the trucks come rolling in. An hour later, an entire world has popped up, its contents and builders carried in on the backs and seats of those trucks. The sun rises over a sea of tents. 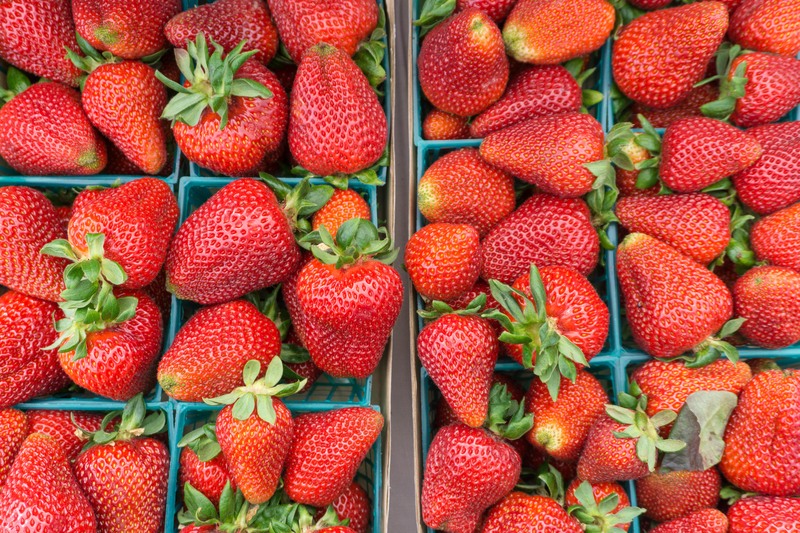 Beneath them sprouts the wealth of California: organic strawberries the size of apricots and avocados nearly the size of grapefruits; small mountains of rainbow roots and of crisp, leafy greens; and carpets of gleaming cherries, in a gradient of pale yellows to ruby reds. Nearby, ice beds are laden with whole quails and smoked salmon; counters prop up rows of crackling pastries and hefty, olive-studded breads; and jars house crafted treasures from fig jam to jicama kimchi. The air will soon fill with scents: freshly baked bread, sizzling meats, and fragrant lavender. At 8 a.m., the crowds begin to descend. This is the Ferry Plaza Farmers Market. 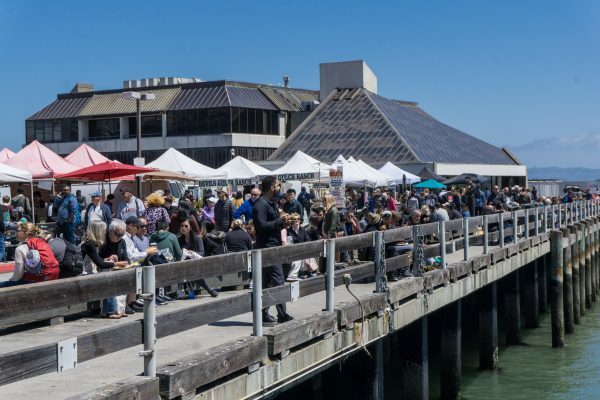 One of the country’s most beloved markets, it’s where regional farmers and foodmakers, renowned Bay Area chefs, visitors from around the world, and locals convene to celebrate the best of what California has to offer. This year marks its 25th anniversary. 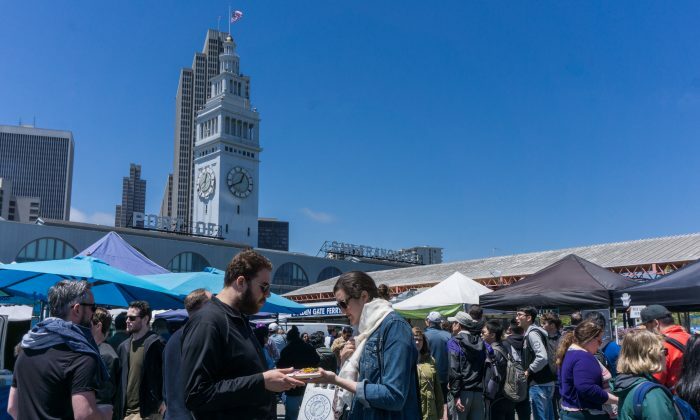 The year-round market is open three days a week, with smaller selections of produce and street food on Tuesdays and Thursdays and a full cast of more than 100 vendors that surround the Ferry Building on Saturdays. In all, around 25,000 people pass through each week. For shoppers, it’s a food wonderland. 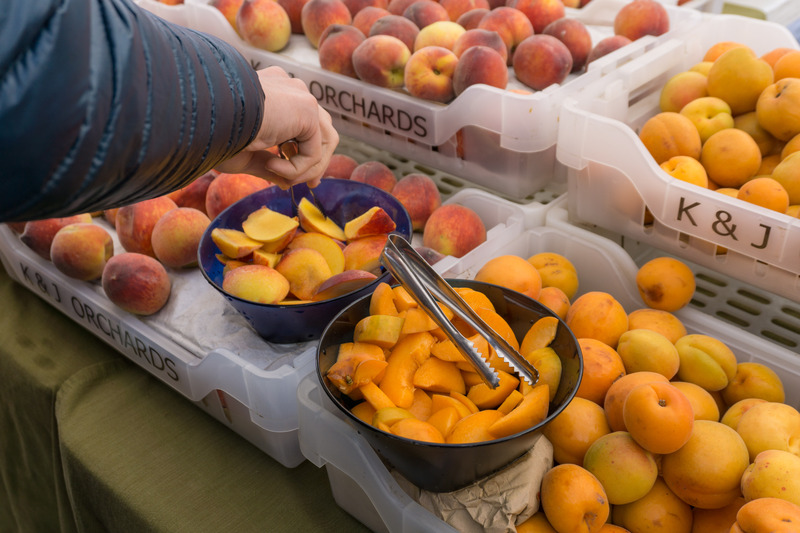 Hands clamor for chunks of bread smeared with fresh goat cheese or juicy slices of yellow nectarines, and sift through giant piles of produce for the best picks of the day. Brunchers enjoy roti chicken sandwiches or trays of momos, with an unbeatable view of the Bay Bridge. But for the vendors, it’s much more: a powerful incubator for small food businesses and farms, their champion and their stage. Today, Blue Bottle Coffee is ubiquitous, with its drinks found in standalone cafes and grocery stores across the country. 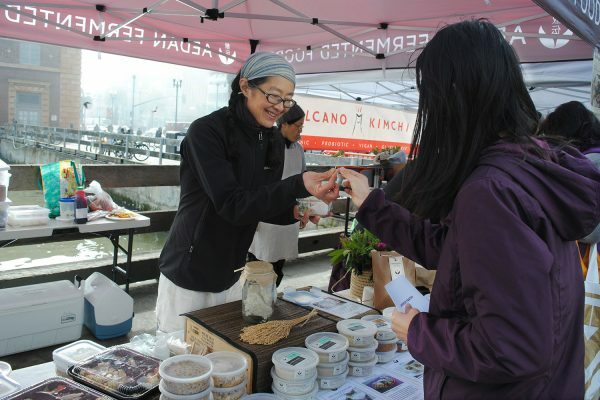 But in 2003, it was a fledgling business that had just opened a stand at the Ferry Plaza Farmers Market. Cowgirl Creamery, whose cheeses are nationally distributed and beloved, also got its start as a market stall here. Both began in, and then outgrew, the market. 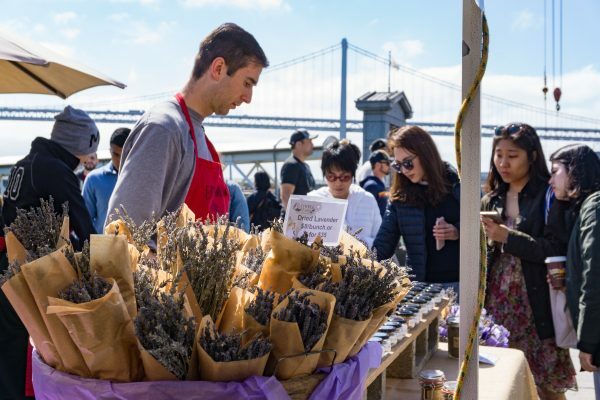 The graduates still operate permanent storefronts in the marketplace inside the Ferry Building, but have since gone on to reach greater heights. The farmers market provides a strong source of income for many businesses, especially ones just getting started. Economically, the market is a unique model. There are low overhead costs—a market space is worlds cheaper to rent than a storefront, for instance—and vendors benefit from direct sales and immediate feedback from customers, an instant gauge of which products customers like and don’t like. It’s also a powerful platform for emerging entrepreneurs to sell and showcase their products. 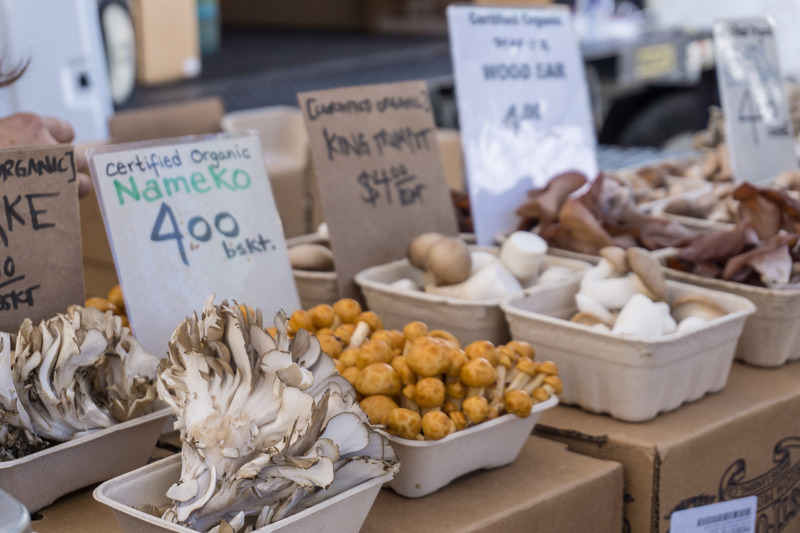 “There are people coming from all over the world and really looking to this farmers market for what’s fresh and innovative,” says Brie Mazurek, communications director of the Center for Urban Education about Sustainable Agriculture, the nonprofit organization behind the market. Locals find their favorites and build fierce loyalties; visitors get a taste and spread the word back home (or shop online); chefs look for fresh and interesting ingredients for their menus; and retail buyers come to scope out the latest products. 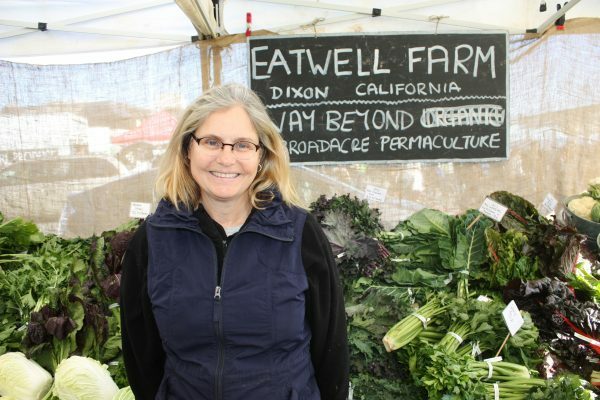 Eatwell Farm, 70 miles away in Dixon, Calif., has been with the Ferry Plaza Farmers Market since the very beginning, 25 years ago. It has never missed a market day. Lorraine Walker, who runs the farm with her family and a small team of employees, credits the market for helping Eatwell grow when her late husband, Nigel, was just starting out. “It gave Nigel an opportunity, as a very, very small farmer starting out on leased land that was just a few acres, to have an outlet to sell what he was growing,” Walker says. After a couple of years, they were able to garner enough interest and connections with customers to become a community-supported agriculture (CSA) farm, which had always been Nigel’s goal. 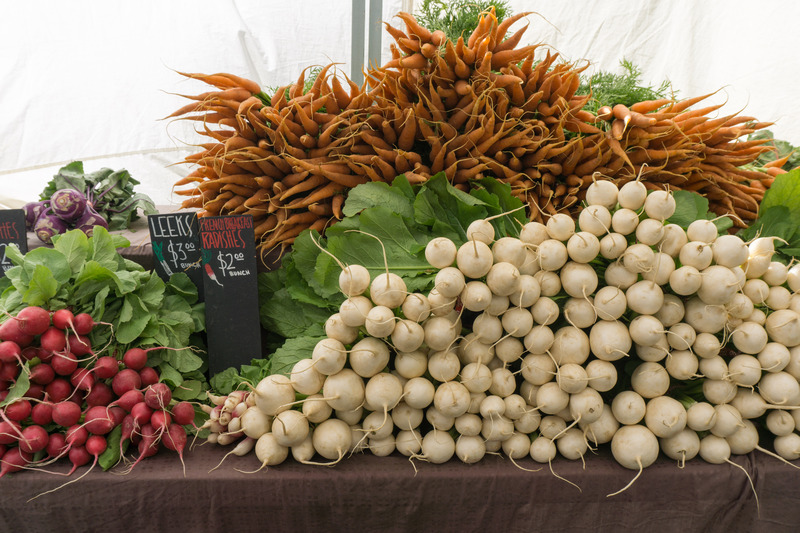 The farm now owns 105 acres of land and continues to sell a variety of organic produce, pasture-raised eggs, and specialty products at its market stand. Many other businesses have gone from having a stand to eventually opening a brick and mortar, or expanding their online presence. Some then leave the market behind, while others stick around. “I think it looks a little different for each business, but we’re here to support farmers and small food entrepreneurs in whatever way we can,” Mazurek says. After Walker’s husband passed away, she couldn’t bring herself to continue going to the Ferry Plaza market, where she and her husband had first met. She now chooses to work at Eatwell’s stand at the smaller Bayview Farmers Market instead. 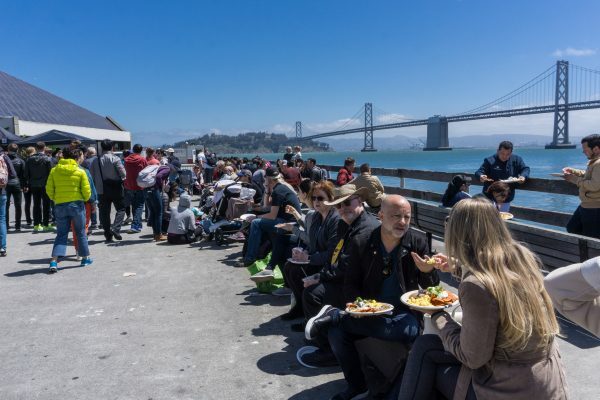 But that sense of community, which has organically grown around and within the Ferry Plaza market, is exactly its unique strength. After all, it began as an institution built by the people, for the people. Following the Loma Prieta earthquake in San Francisco in 1989, a damaged freeway in front of the Ferry Building was removed, leaving a huge, empty plaza. The people of San Francisco called for it to be turned into a community space. After a hugely successful pop-up market in the fall of 1992, signatures filled a petition for a permanent installation. 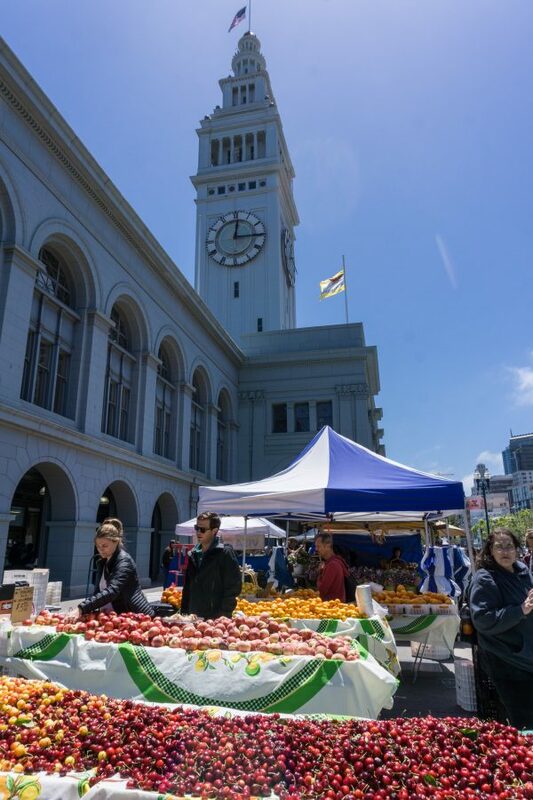 The Ferry Plaza Farmers Market was born the following year. Today, it remains a convivial meeting place for friends and family, fellow shoppers, chefs, and the farmers and foodmakers themselves. “In a world where we feel disconnected, the farmers market is a really, really great place to find connections,” Walker adds. For vendors, those connections are precious. When farmers are able to meet customers face to face, deep relationships develop—ones you wouldn’t typically make with your grocery store trucker or cashier. It’s much more intimate, establishing loyalty on a more personal level. “That’s one of the reasons why people shop farmers markets,” Walker says. Some customers have told her that they won’t join Eatwell’s CSA program because they’d rather find them personally at the market. It’s also why working at markets is such a joy for Walker, herself. She fondly recalls the “intensely social” environment at Ferry Plaza. The place hums with so much constant energy that, afterward, she would often find it hard to sleep—despite having woken up at 3:30 that morning. 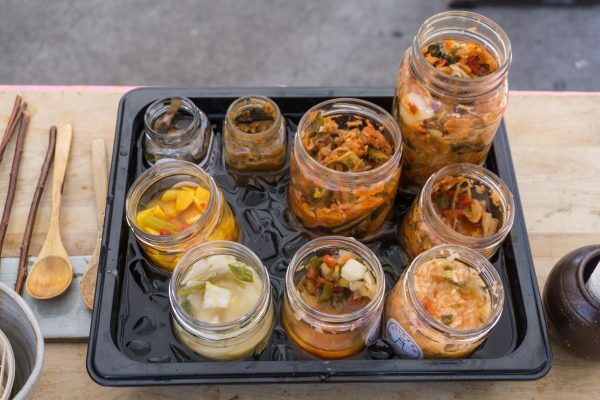 While Eatwell Farm is a Ferry Plaza veteran, Volcano Kimchi represents the new generation. 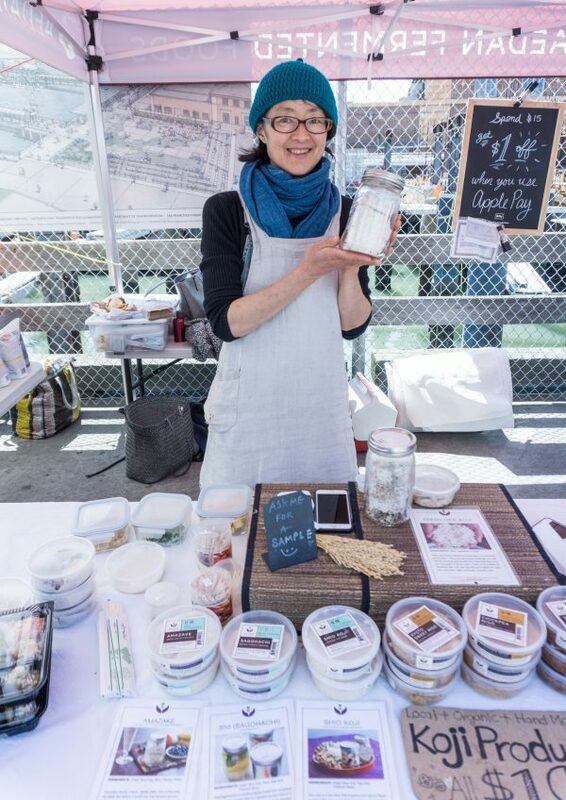 Founder and self-dubbed “fermentress” Aruna Lee first started selling her organic, vegan kimchi there a year and a half ago. At the time, she had only two products: napa cabbage kimchi and jicama kimchi. Now, she has at least eight. 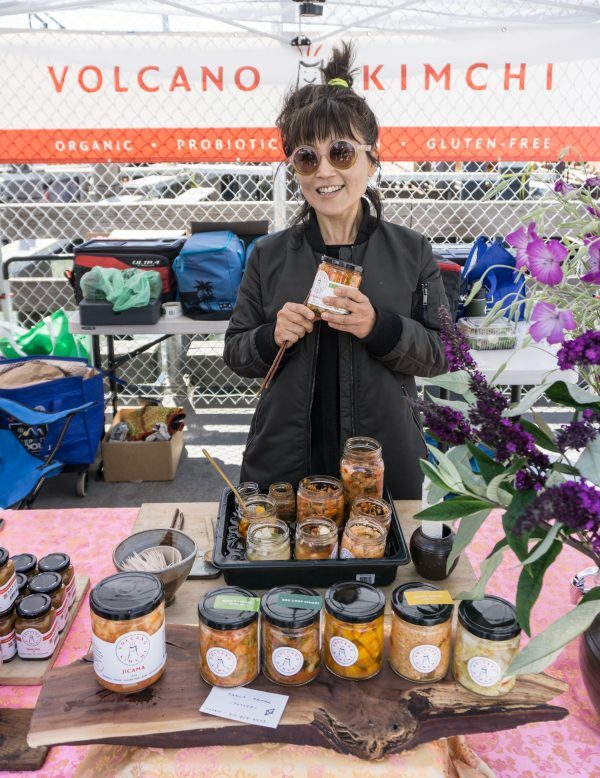 She spears a pickled mushroom on a toothpick—her “magic mushrooms,” she calls them, made with organic mushrooms she found at Far West Fungi, another vendor. It’s vaguely sour and a little smoky, a distant relative of the pungent, better-known cabbage kimchi. There’s also golden beet kimchi, tangy-sweet with a subtle crunch, bathed in pickling juices tinged sweet by the roots. This experiment, inspired by produce from Eatwell, has been popular, so Lee’s thinking about creating a label for it and turning it into a permanent product. The surrounding bounty and fellow vendors at the market provide endless creative fodder. Inspiration can evolve into collaboration: after meeting at the market, many restaurants and crafters start sourcing products directly from their fellow farmers. Lee buys vinegars from local vendors, and napa cabbage and other produce from Eatwell. In turn, Eatwell has begun including Lee’s finished kimchi, made from its own crops, in its CSA boxes. For her ssamjang, a pungent Korean dipping sauce made from a mix of miso and gochujang, Lee sources miso from her market neighbor, Aedan Fermented Foods. That mutual support also manifests on a smaller scale. A man stops by Volcano Kimchi with a box of plump dates from Flying Disc Ranch. They’re the best in the world, Peter, Lee’s husband, says, before inviting the man to have some kimchi. Next door at Aedan, a young woman from Far West Fungi hands a brown paper bag to the owner, who peeks inside. The owner’s eyes widen in delight at the sight of beautiful maitake mushrooms—“Wow, very special today!”. She then sends the young woman off with miso soup and a bento box of goodies. Trading goods is a regular and anticipated event, Lee explains, a small way for vendors to support each other. “I guess at old farmers markets, hundreds of years ago, they probably traded like that, right?” she says, laughing. But connections run deeper than mere business relationships. In the end, it’s the social connection that brings people back to the market again and again, says Peter. Fresh, top-quality food is a given—it abounds at every stall. But the real heart of the market is its people, and the relationships forged between them. 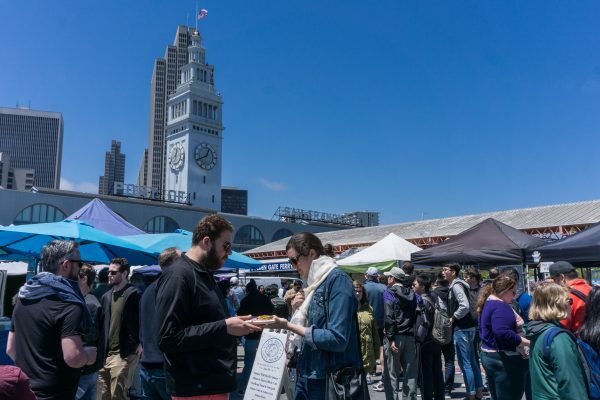 The Center for Urban Education About Sustainable Agriculture (CUESA) is celebrating its 25th anniversary with a birthday party at the Ferry Building. 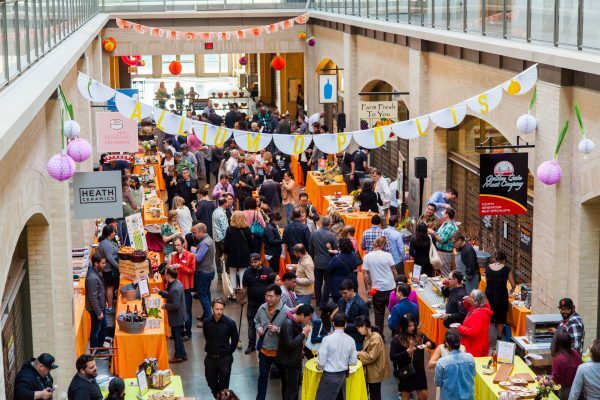 Mingle with community farmers and chefs while enjoying unlimited, local fare from 45 restaurants and 20 spirit companies, wineries, and breweries, along with a range of hands-on activities, a silent auction, and live music. Proceeds will benefit CUESA’s free education programs. $140 to $165 per person.